Independence supporters block a street during a demonstration to commemorate the anniversary of the referendum last year. Their sign, written in Catalan, reads: "Let's change the regime. We voted for independence." 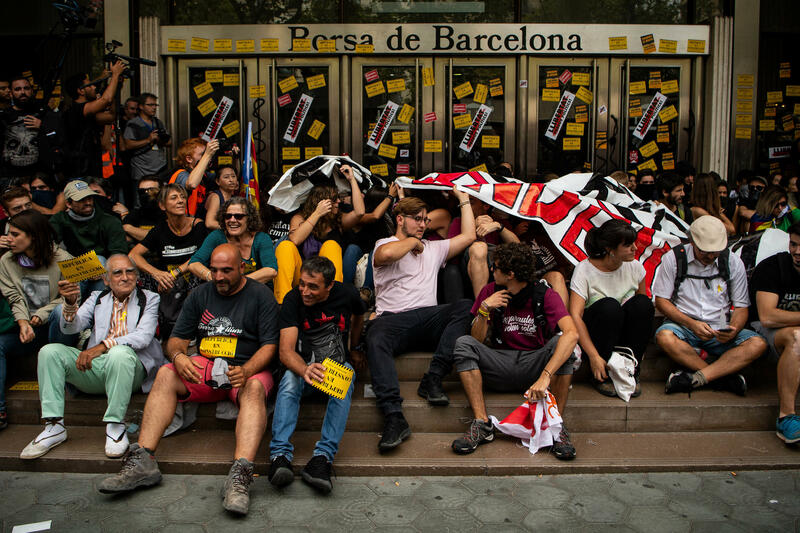 Independence supporters block the entrance of the Barcelona Stock Exchange on Monday, commemorating one year since the referendum that declared Catalonia independent — and that was immediately rejected by Spain's central government. It was there that his predecessor, Carles Puigdemont, had tried last year to vote in an independence referendum that Madrid had declared illegal. And it was there — along with many other places — that violence broke out between referendum voters and the riot police trying to block them, leaving hundreds injured. A year later, Puigdemont is now living in self-imposed exile in Belgium, where he has been fighting Madrid's attempts to bring him back to face trial. He is joined there by several of his former aides, who also fled the country after Spain's central government sacked Puigdemont and his Cabinet following last year's referendum. At least nine other Catalan ministers were arrested on charges of rebellion, sedition and embezzlement after the vote. "Let us not stray from the only possible way to live in a full democracy: the [Catalan] republic and its international recognition," the former president of the traditionally semi-autonomous region said in a video message Monday, according to the Guardian. 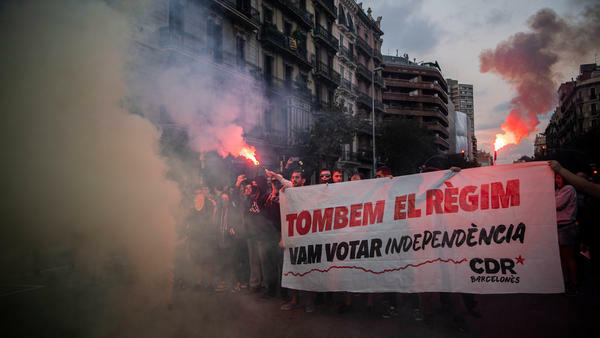 Back in Catalonia, thousands of protesters marched through Barcelona, demanding that Madrid respect the results of the referendum, which the separatists won handily amid a boycott by unionist voters. The demonstrators parked themselves outside the city's stock exchange building and disrupted train service across Catalonia. Before police cleared the train stations of protesters, around midday, they reverberated with chants of "October 1, we don't forgive and we don't forget!" Independence activists, known as the Committees for the Defense of the Republic, posted images throughout the day of students on strike from class and other protesters gathering in massive numbers in several cities. During one demonstration, the protesters lofted big boxes representing the votes cast for independence and ignored last year. The gathering comes just days after a similar protest ended in clashes with security forces, injuries to at least two dozen people and several arrests. Meanwhile, Catalan leaders and the government in Madrid remain at a standoff. Former Spanish Prime Minister Mariano Rajoy, the conservative who was ousted by a no-confidence vote earlier this year, had taken a hard line against Catalan secessionists. But he was replaced by Pedro Sánchez, a Socialist party leader who has signaled a more conciliatory approach to Torra and his fellow pro-independence Catalans — though he is hamstrung by his party's tenuous hold on power in Madrid. Complicating the tangled situation still further is the fact that Catalans are not entirely united behind the independence effort. Far from it, actually: The Associated Press notes that the region is nearly evenly divided on the question of independence, with 46.7 percent supporting it and 44.9 percent in opposition. Still, Torra, Puigdemont's handpicked successor, has maintained his hard line: "A year ago, the Spanish state repressed such a basic right as the right to self-determination and also freedom of expression," he said Monday, according to El País. "The October 1 vote is the seed of the republic," he added.